TAMPA, FL -- The Tampa Bay region will transform into the hotbed of college football activity leading up to the 2017 national championship game being played at Raymond James Stadium on Monday, January 9. 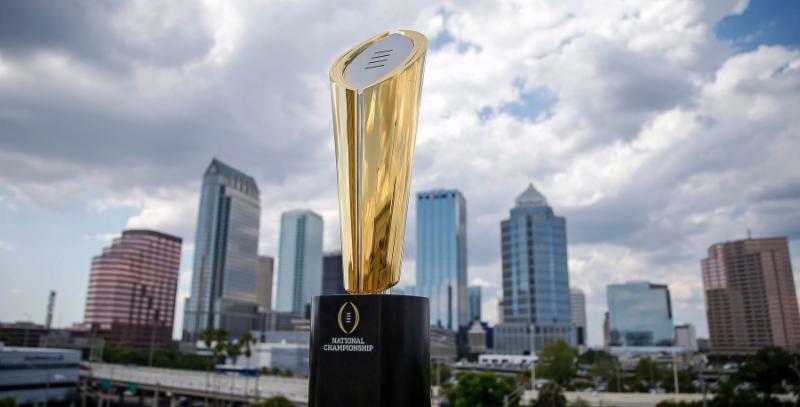 The Tampa Bay Sports Commission and the College Football Playoff unveiled the plans for the 2017 Championship Campus and announced many of the events and initiatives planned at a press conference today. 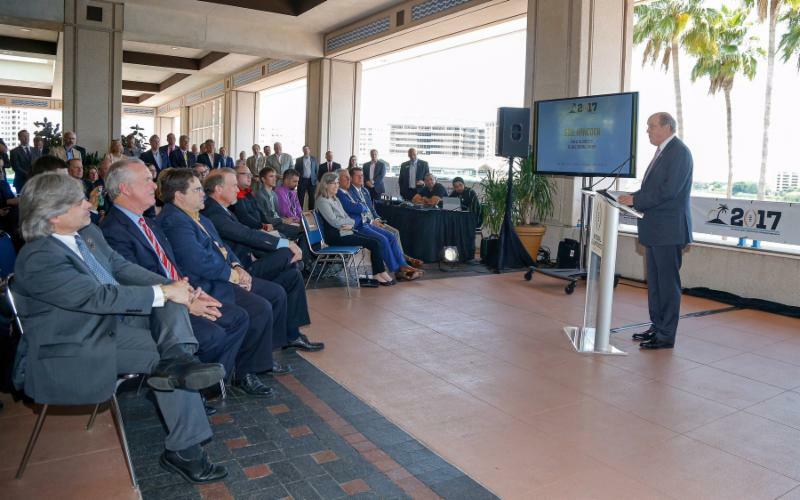 The press conference, hosted at the Tampa Convention Center with the water glistening off the Garrison Channel in the background, showcased one of the centerpiece venues that will be home to events during the days leading up to the 2017 national championship. The scenic Riverwalk section of downtown will be active from Friday, January 6 through Sunday, January 8 with events that the Tampa Bay Sports Commission says will elevate the bar that has been successfully set by the previous two national championship host cities. "We will rise to the occasion as we do every time and put on the best event that you ever had," said City of Tampa Mayor Bob Buckhorn. "We are proud to plant Tampa's flag across the country as the best city hosting the best events in America and doing it flawlessly"
Tampa Bay area political and community leaders were proud to boast that the events being held will provide fans the opportunity to enjoy being a part of the national championship atmosphere even if they don't have a ticket. "I've had the privilege to be involved in several national and international events," said Hillsborough County Commissioner Ken Hagan. "However, with most of these events, they are limited to those who have the financial resources or connections to access the event. I'm very proud to say that's not the case with college football playoff national championship. They highlight the college experience and offer many avenues for fans to be involved and enjoy the overall experience whether you have a ticket or not." College Football Playoff Executive Director Bill Hancock, who was the director for the NCAA Final Four when it was hosted by the University of South Florida in 1999, reminisced briefly about his experience with that event and praised the Tampa Bay Sports Commission with his positive take on the Tampa Bay area. "Things have changed so much in this area from 22 years ago when the Final Four bid was awarded," said Hancock. "What a great success story that you have in Tampa Bay. What an awesome job you've done with downtown Tampa. It's remarkable. Please don't take it for granted and don't be ashamed to talk about it." A full schedule and information about the 2017 Championship Campus and the events can be found at www.TampaBay2017.com, the Official Tampa Bay Sports Commission website dedicated to updates on the 2017 College Football Playoff national championship game festivities. As further information comes available, it will be added to the schedule at www.TampaBay2017.com. Opening of Playoff Fan Central at the Tampa Convention Center. This event is open daily January, 6-8 and will give thousands of fans the opportunity to be a part of the College Football Playoff national championship experience. The daily schedule will include appearances from the participating institutions' bands, cheerleaders and mascots and mini pep rallies for each participating team. Playoff Fan Central will be filled with various activities including interactive games, sponsor activities, special guest appearances and exhibits celebrating college football. This family friendly event will create lifetime memories. The first of three AT&T's Playoff Playlist Live! will hit the stage on Friday, January 6 at Curtis Hixon Park. The music continues nightly through Sunday, January 8 for three nights of nonstop jams! The AT&T Playoff Playlist Live! promise to feature a sensational mix of artists to include popular hit-makers, up-and-coming bands and long-time favorites. Following the performances at Curtis Hixon Park, the downtown Tampa sky will be bright with dazzling fireworks. Playoff Fan Central (Tampa Convention Center) and Playoff Playlist Live (Curtis Hixon Park) continue. 2017 College Football Playoff Media Day, Amalie Arena. College Football's top two teams that have advanced through the first-round playoff gather to discuss College Football Playoff national championship game. Extra Yard 5K starting line at Amalie Arena. A family friendly 3.1 mile race will be run in the heart of Downtown Tampa's Championship Campus and will incorporate a scenic route on a portion of iconic Bayshore Boulevard. In addition to the 5K, a 1-mile Family Fun Run will also be held along a portion of the course. All proceeds will benefit Extra Yard for Teachers, the College Football Playoff's primary initiative that goes the "extra yard" by honoring, celebrating, inspiring and empowering teachers. Race day festivities will include live entertainment, several race sponsor activities and a post-race awards ceremony. Registration for the 5K race includes one (1) ticket to Playoff Fan Central, a participant shirt (for the first 1,000 only), a finisher's medal and an entry for one (1) into the drawing to win two (2) tickets to the College Football national championship. The 1-Mile Family Fun Run registration includes one (1) ticket to Playoff Fan Central and an entry for one (1) into the drawing to win two (2) tickets to the College Football national championship. Taste of the Championship, the Florida Aquarium. Football fans can sample incredible dishes from the country's top chefs, all while mingling with former college football star players. Participating Tampa Bay area restaurants include 717 South, Ava, Bern's Steak House, Boca, Cigar City BrewPub, Columbia Restaurant, Datz, Fodder & Shine, Goody Goody, Haven, Mad Dogs & Englishmen, Mise en Place, The Refinery, Roux, and Ulele. Tickets for Taste of the Championship charity event benefit Extra Yard for Teachers. Seating is limited.